Brian Ward, managing editor of the Halifax Chronicle Herald, has asked me to correct two statements about reporter Andrew Rankin in my August 2 post about the fatal prom night car accident in Leitches Creek. Rankin’s one-sided reports falsely portrayed 21-year-old Hayden Laffin as having been drunk June 10 when his car struck and killed 17-year-old Joneil Hanna. Rankin’s reporting fuelled a social media firestorm, including threats against the Laffin family. Police say their investigation proved Laffin was not impaired. First off, Ward writes that I “named and defamed Rankin and made no attempt to talk with him.” I agree I should have contacted Andrew, and I apologize for this lapse. I don’t think Ward’s other complaints stand up to scrutiny, but readers can judge for themselves. Rankin made no attempt to seek comment from Hayden or his family until three weeks—and a slew of lurid stories—after the accident. The reporter messaged Hayden two days after his first story. He didn’t have the name of the driver before then. He also called Hayden’s mother at the Shopper’s Drug Mart where she works at least three times. Rankin got another number for her and called several times. [Hayden’s grandfather] Terry Laffin messaged to say she wouldn’t be speaking with him. Hayden received no messages from Rankin—by email, text, or Facebook Messenger. 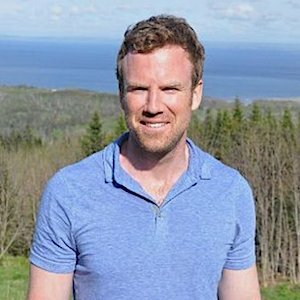 In response to Ward’s complaint, he checked his email inbox and spam folder, but found no messages from the Herald. The police held Hayden’s phone for two weeks after the accident, but when he got it back there were no messages from Rankin. Hayden deleted his Facebook account a day or two after the accident—for the understandable reason it was flooded with hateful comments and death threats. A supervisor at Shopper’s Drug Mart confirms that approximately 17 days after the accident, someone from the Chronicle Herald called and asked to speak with Melissa Hayden, Hayden’s mother, who was on leave. The next day (Day 18) the same person called back, and asked the supervisor for a contact number. Melissa has not worked since the day of the accident. As a single parent, she has been coping with serious threats to the safety of her children, and she was also concerned about the potential for suicide, concerns aggravated by Rankin’s inflammatory articles. One of Rankin’s stories quoted an unnamed uncle of Hayden’s, seemingly speaking for the family and saying it would have been better had he taken the breathalyser. Hayden has two uncles. Both live in Alberta. Neither has spoken to Rankin. Rankin interviewed a relative who identified himself as an uncle and has the recording. After you published your post, we checked again and while the man called himself an uncle, he’s a great-uncle. Ronnie Laffin is Hayden’s grandfather’s brother. I don’t think he meant any harm, but he does not know Hayden well, and he certainly does not speak for the family. There is a world of difference between someone’s uncle, and someone’s grandparent’s brother. Responding to this explanation in a follow-up email, Ward said my original wording “suggests to the average person that Rankin made up a source.” That was not my intent at all. Rather, the fact that Rankin was so credulous as to accept a stranger’s claim to be Hayden’s uncle (when other news outlets checked this out an found it wasn’t true), hints at confirmation bias, an eagerness to accept and publish anything that supports his theory of the case. 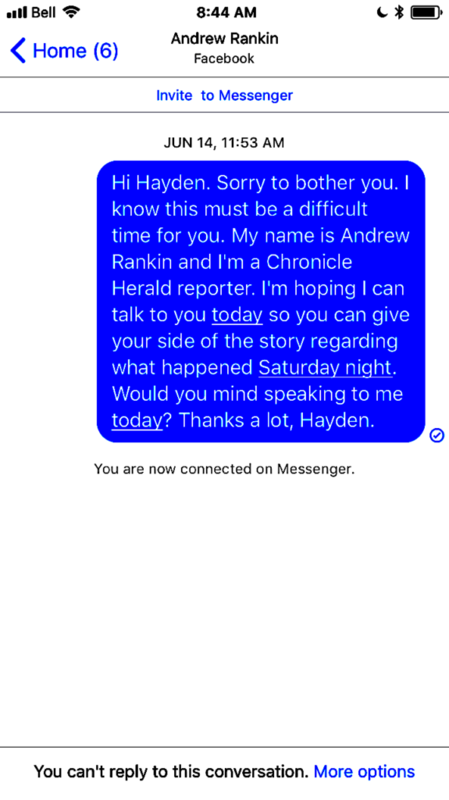 [UPDATE] Since this post was published, the Herald has furnished a screenshot showing that Rankin did make at least one attempt to contact Hayden Laffin via Facebook Messenger four days after the accident. By this time, Hayden had deleted his Facebook account in response to an outpouring of hate messages. The blue checkmark at the bottom right of the message indicates that the message was delivered, but not read by the recipient. Had Hayden opened the message, the checkmark would have been replaced by his avatar. He couldn’t open the message, because he had deleted his Facebook account. Or at least, he tried to. Hayden and Rankin appear to be joint victims of Facebook’s practice of making account deletion extremely difficult, and for retaining ghostly remnants of accounts even after users think they have deleted them. In short, I was incorrect to say Rankin made no attempt to contact Hayden until three weeks after the accident. He made at least one perfunctory attempt four days after the accident, and more concerted attempts three weeks later.